The end of the world is here, and I never thought it'd sound so beautiful. Nier: Automata was one of the most intriguing games of 2017. With machines fighting androids over stakes grander than either could imagine, I was riveted by the story and its characters. The music accompanying the journey was sublime, but also echoed the sorrow that permeated the ruins of a fallen civilisation. Composed by Keiichi Okabe and the Monaca team, every one of the tracks was hauntingly memorable. Many of the pieces are like a hymnal, beckoning to a tragic past. What would music sound like in a world devoid of humans? Angelic, according to Automata. One of my favourite pieces is in the City Ruins called "Rays of Light," starting as a lone piano before the voice breaks in. Navigating the abandoned buildings of the city feels desolate and even coming across the wandering machines doesn't offer much solace. The decrepitude would have been outright depressing if not for the beauty of this song. It's as though it represents the suppressed yearning in 2B and 9S for deeper meaning as they assist the Council of Humanity in their dark cause. The voice feels like a chorus in the background, lamenting the futile battle that is causing so much destruction and pain. It's a reminder that humanity's legacy of bloodshed continues by proxy through the androids and doesn't look like it will end any time soon. The Bunker seems like home, but as the name of the song betrays, it's a Fortress of Lies. The music is softer in general, like the light reverberations in the vacuum of space. You're safe here from the onslaught of machines below and find comfort in the soothing track. One of the most shocking revelations in the first playthrough is that the aliens who forced humanity from the planet were actually exterminated by the machines. That seems to imply humanity can return from the Moon and that the android's objective is close to completion. But by the end of the second ending, 9S learns that humanity went extinct long ago and YorHa's actual mission is to propagate that deception to give the androids a false purpose. The war with the machines is based on a terrible lie. This makes the music even more poignant. Whereas before, it was the source of solace, now, it feels like whispers warning you about that deception and deploring it as they're all helpless to change it. I wrote earlier about how tragic the sidequests from the Machine Village were. The music in the village sounds like a group of kids singing and is very cute. It also marks the stark contrast of the dangers of the outside world with these peace-loving machines wielding their white flags. I still get depressed thinking about their eventual fate, especially the machine children. A virus infects all of them so they end up cannibalising each other and destroying everything they hold dear. Pascal, the leader of the village, escapes with the children. When they're attacked by a massive army of machines, A2 fights side by side with Pascal to defend them. But it's pointless. In the time they were away, the machine children, seized by sheer terror of contemplating what awaited, committed suicide. Nier: Automata is really cruel to its characters, machine, human, and android alike. Machine romances can be strange. Especially the unrequited kind. The goliath class machine, Simone, is obsessed with beauty and covers her body with the corpses of androids as though they were jewels. It's a warped vanity made clear by her words and her operatic clothes: "Look at me. Oh please look at me. I want your eyes to look upon me alone. 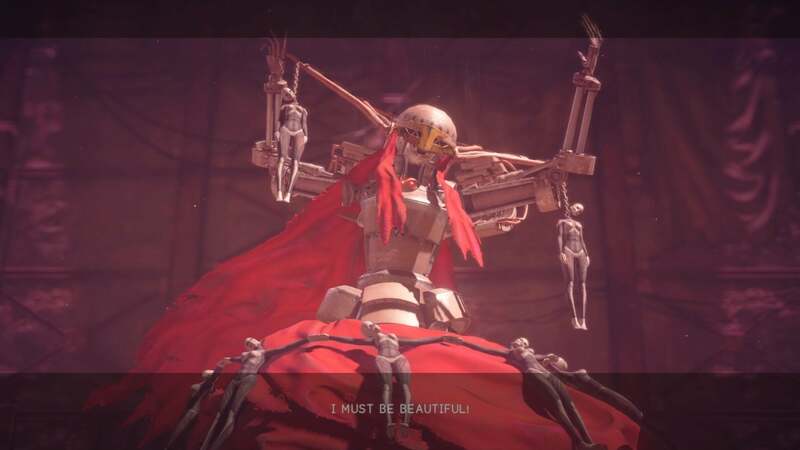 Have I not become beautiful?" Simone's desire to understand love led to her associating beauty with the concept as "I still don't understand what it means to love someone..."
Simone had heard a rumour that to "devour the body of an android" would help her to "gain eternal beauty." She's cannibalising androids in her search for love. The music represents that corrupted passion as she learned how to sing, believing music "can make someone have feelings for you… So I practiced every day. But he still won't look my way. I ate more androids. I even ate machine lifeforms." Talk about twisted appetites. One of my favourite parts of the game is the fact that there's retro versions of all of the songs when you enter 9S's hacking mode. It's a throwback to the 8-bit era and perfectly encapsulates the retro gameplay of the hacking game. It's also just a blast hearing those gorgeous melodies in simplistic tunes that would feel home on a NES. There's a theory about a musical protolanguage that posits the language began with animal songs representing basic ideas like challenging a rival or expressing a desire for courtship. Music is sort of the base collective idea where our articulation springs from. In the same way, retromusic is a callback to the earlier days of gaming, and the way these tracks blend the boundaries between the modern and the old is delightful. The story behind how they were composed is pretty cool as well. Many of the other tracks are equally compelling, like the desert boss music This Cannot Continue, and the beautiful rhythms of Wretched Weaponry. Every aspect of the game gets that special love and even the final credits in the true ending get turned into a shooting sequence that is as symbolic, in the destruction of the human team, as it is fun. The best games merge awesome gameplay, story, and music. Nier: Automata excels on all fronts and creates an experience that both feels and sounds uniquely automata. The music really moved me even if the game sometimes did my nut! My favourite musical moment is towards the end of route C where you're entering the tower and have to fight off an endless stream of machines and the game fires up with Song of the Ancients from the original Nier. I won't lie-- there might have been tears. Also Weight of the World is a magnificent ending theme. There were definitely tears when that full chorus version played during route E.
Only read this after i posted, but yes. The ending theme really hit me in the feels. It was when I got to the Amusement Park and everything about it and the theatre show they put on, that my gaming world was completely rocked. So much of it until that point was simply stunning but that whole part moved me in ways, very few games have in the last decade. Damn just reading this remind me I still have like another 10 endings or so to go. Returning to the amusement park in route C is one of the great player punches in gaming. That said, route C is pretty much player punch after player punch. The credits scene of the final route where all the avatars comes to help and sacrifice. The feels happening as the vocal chorus came made me shed a tear. This for me is likely one of the greatest soundtracks ever created for any medium (film, television, video ames, etc.). It is so absolutely complimentary to the subject matter in all the right ways at all times. NieR: Automata's OST is only matched by Kow Otani's Shadow of the Colossus score in my eyes. The original Nier soundtrack is still my all-time favourite from any source (games, movies, TV), and while Automata's wider recognition worried me that it might have 'sold out' in some way I'm glad that proved not to be true. This soundtrack is a seamless expansion of the first - now I'll have to see how many spin-off albums this one gets! The more I hear about this game, the more I feel like I'm going to buy a PS4 to play it. I've spoiled the story for myself somewhat, and normally for me that would be enough to skip it, but it sounds amazing and seems exactly like the sort of game I love. I wasn't that impressed when I played the demo and assumed that fighting robots as the main enemy for the whole game would be really boring. How wrong I was. I got the game after seeing all the favourable reviews and am really glad I did. The gameplay is great, but its the music and story that really set it apart from most other games this generation. I think the story is probably good enough that you'd still really enjoy all the highs and lows even if you'd read a synopsis. I still tear up thinking about some of the scenes (many mentioned above). I grabbed the soundtrack recently and just can't get enough of it.